Just a little under two centuries ago, an early American frontiersman made a reputation for himself as being tough as nails, a fierce fighter, and a someone who sacrificed his life at the Alamo, fighting for a cause he felt strong enough to die for. The big blade he carried became synonymous with his name--Bowie Knife--and since then has represented the mark of a knife that is strong, powerful, and gets the job done. Another name has also gained a reputation for itself. That name is Hinderer. Rick Hinderer has been designing and building some of the most respected knives on the market, and now, with the Hinderer Ranch Bowie, he has taken an American legend and turned it into the next knife you'll want in your hand. 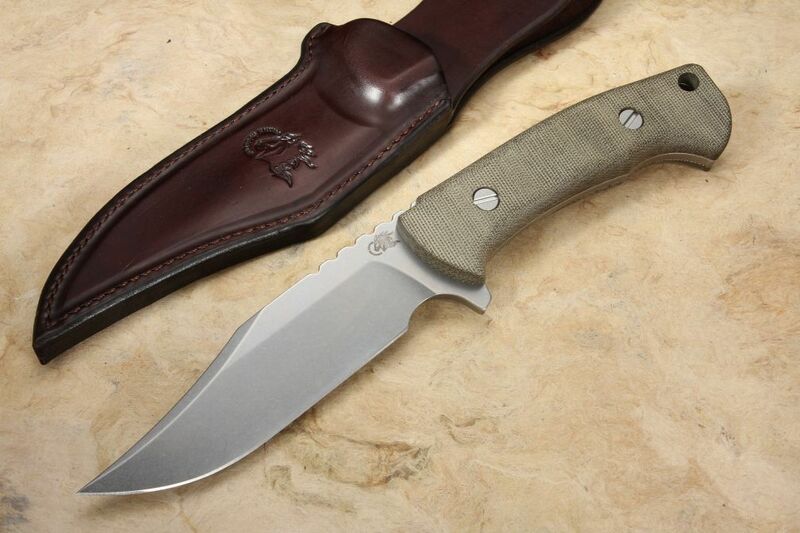 This full-tang, fixed blade bowie style knife is 10.5" in overall length with a 5.25" CPM-3V steel blade. This tool steel is hardened to a HRC of 58-60, which makes it extremely tough, yet still able to keep a razor-sharp edge for cut after cut. 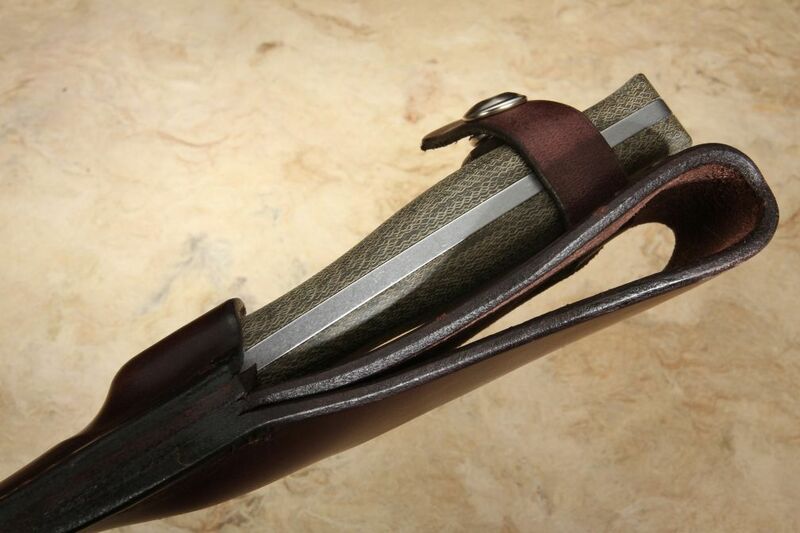 The .1875" blade stock features a generous flat grind to the 4.625" long edge, giving it a lot of support for strength and chopping, without a thick profile that would get in the way of slicing. Each blade is stonewashed to hide fine scratches during future hard use. A finger choil on the blade, as well as thick jimping on the blade spine, give you strength as well as precision in every cut. 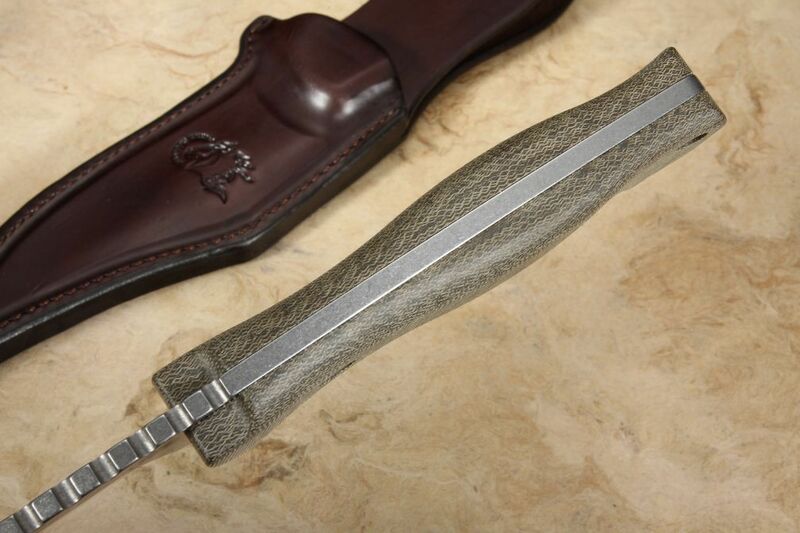 The 5.25" handle is clad in 3D sculpted Micarta scales. A lanyard hole in the handle opens up the possibilities of other carry options or applications using paracord. 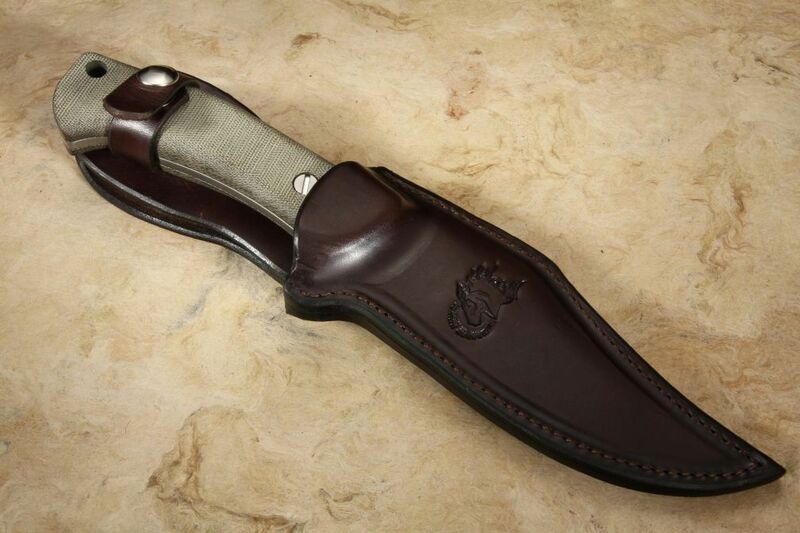 A beautiful custom leather sheath keeps this 10.5oz blade at your side, ready for whenever you need it most. 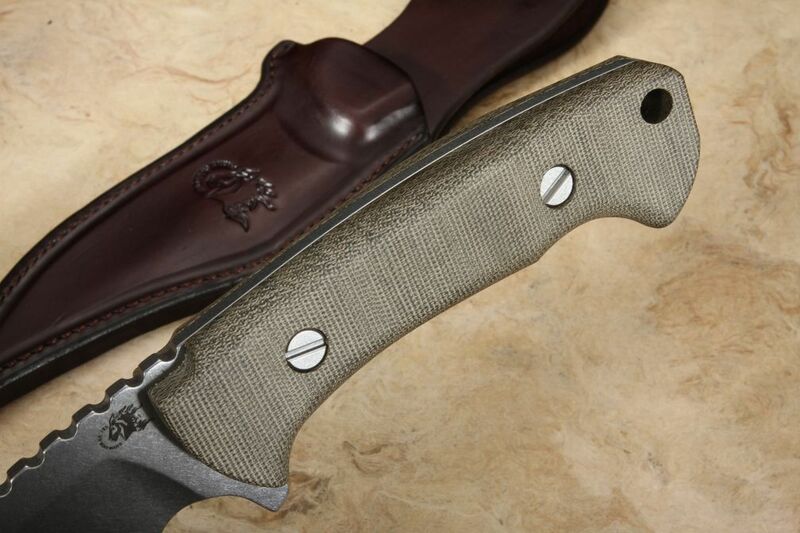 So whether it is camping, tactical, hunting, or just another day at the ranch, Rick Hinderer proves the worth of every blade that carries his name. 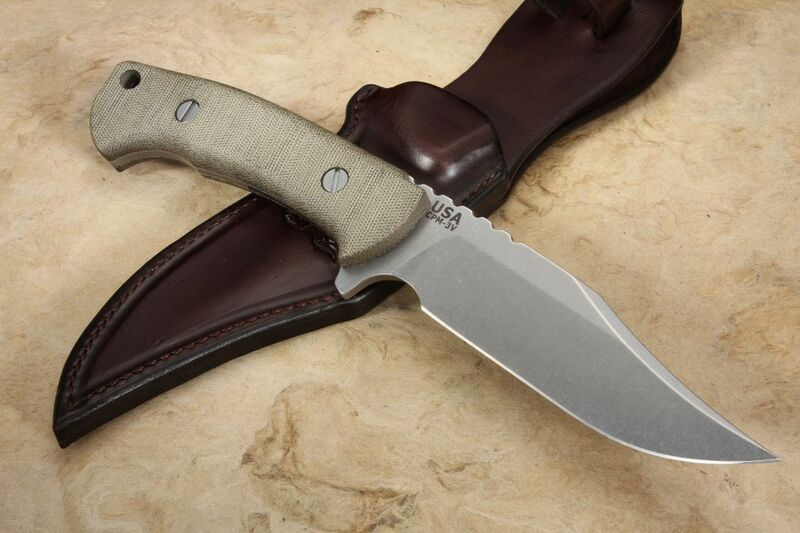 Rick Hinderer Knives are proudly made in the USA, just as they have been for decades. Every Rick Hinderer Knife is guaranteed for life against craftsmanship and materials defects. As an authorized dealer of Rick Hinderer Knives, Knifeart.com features fast, free shipping in the USA as well as a satisfaction guarantee. If you are not satisfied with your purchase, for any reason, simply return it for a refund and you will not be charged restocking fees.